At Shop With Us, it’s hard for Us to pass up on an amazing deal on a designer bag. Luckily, we can always count on snagging a chic find for our collection at Nordstrom. With Tory Burch pieces regularly added to the sale lineup, now is a great time to upgrade our purse game without worrying about a hefty price tag! Editor’s Note: Tory Burch items are now up to 60% off at Nordstrom – See them all! See It: Grab the Tory Burch Fleming Leather Wallet/Cross-Body bag for 33 percent off the original price of $348, now $233 while it’s still in stock. Thinking of a different style? Scoop up the Tory Burch Fleming Distressed Leather Tote at 33 percent off the original price of $598, now $401. Be sure to check out other fabulous styles to give your closet a major upgrade. Everything from camera bags, shoulder styles, small totes and more are up for grabs, and with these fabulous picks cruising the sale rack with a cool 33 percent markdown, you can bet that we have already added a few pieces to our shopping cart. As for our favorite design from the lineup? 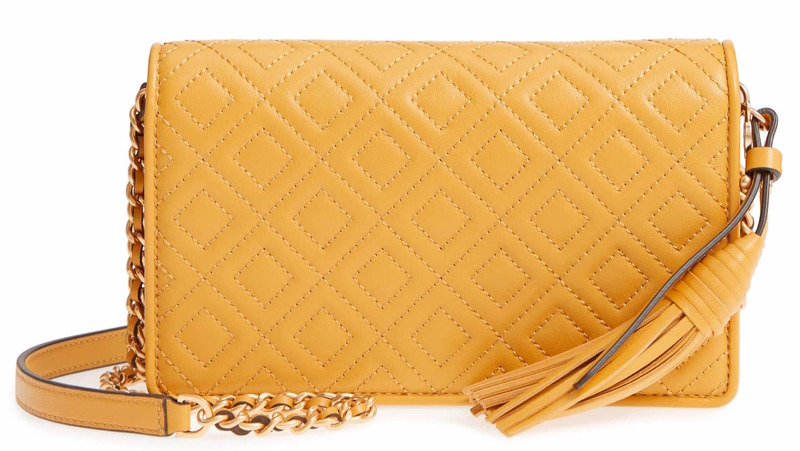 The Tory Burch Fleming Leather Wallet/Cross-body bag. 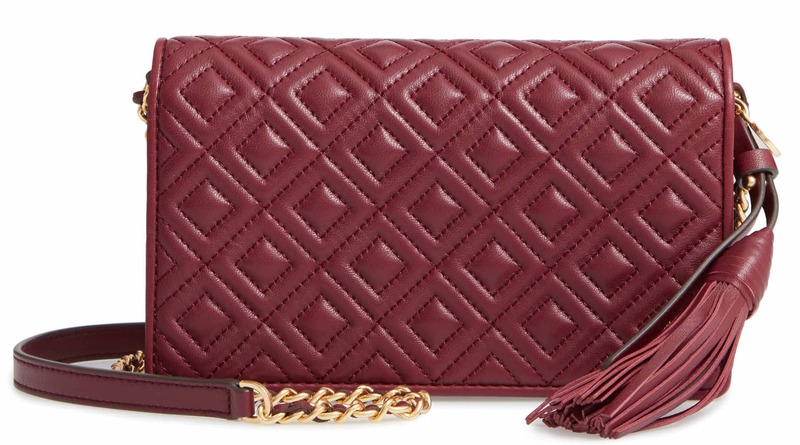 Flaunting a beautiful quilted finish, this style is sure to turn heads. Offering the option of a hands-free carry, an over the shoulder wear or a clutch, the removable chain and leather strap is a chic plus. We are obsessed with the Larkspur (blue) shade! Boasting a stunning pastel-like hue, this piece is a great pick for fashionistas who love to add a pop of color to their ensembles. Blending bohemian glamour with effortless style, this carryall can be worn to the office, while running errands, hanging out with friends and beyond. A versatile staple, this stylish bag is also available in Imperial Garnet (burgundy), which is a great pick for those who prefer dark accessories during fall and winter. If you’re like Us, and enjoy wearing bright colors year-round, then the Daylily option (yellow) is just the ticket. We believe that rules are meant to be broken especially when it comes to style, and this piece will help Us make an unforgettable statement. Whether we plan on keeping it casual or heading out to a special event, this bag will have Us stepping out in style every time. Dubbed as the cutest little bag by Nordstrom shoppers, it’s easy to see why this purse is flying off the shelves. Reviewers love that its leather build provides a soft feel and a sophisticated finish, while others appreciate its roomy construction and functional design. Thinking of grabbing a different style? Look no further! The Tory Burch Fleming Distressed Leather Tote is a stunning alternative. Designed with sleek diamond stitching, this textured find offers a stylish finish. Its subtle distressed detailing also adds dimension to the bag. Complete with Tory Burch’s signature double-T logo and a tassel charm, this purse offers a polished, yet elegant appeal that will certainly shake up our style. Thanks to its top chain and leather straps, we can flaunt this eye-catching design with an over the shoulder carry or in the crook of the elbow for a poised look. This sophisticated design will pair well with any of our work-ready ensembles and beyond. A roomy design that can hold a variety of essentials ranging from long-line wallets, keys, and even an assortment of work files, we can count on this piece to keep Us organized and our important documents easily accessible. Its interior zip and wall pockets are also a plus for those who carry small items like lipsticks and lotions to keep them from ruining other items in our bag. For those who love flaunting a classic style, the svelte black hue is a winning pick. If you prefer a vibrant pop of color, then the cherry apple shade is the way to go. This designer bag is certainly worth the investment. Even better, it’s currently marked down! You can never go wrong with a fashion-forward and affordable piece. See It: Grab the Tory Burch Fleming Leather Wallet/Cross-Body bag for 33 percent off the original price of $348, now $233 while it’s still in stock. Thinking of a different style? Scoop up the Tory Burch Fleming Distressed Leather Tote at 33 percent off the original price of $598, now $401. Be sure to check out other fabulous styles to give your closet a major upgrade. Shop all Tory Burch items up to 60% off at Nordstrom – For a limited time!